From the Hancock County Courthouse, go east on Hwy 22 for 7.5 miles to Springfield Church Rd. Turn left on Springfield Church Rd and go 3.4 miles to Springfield Church. 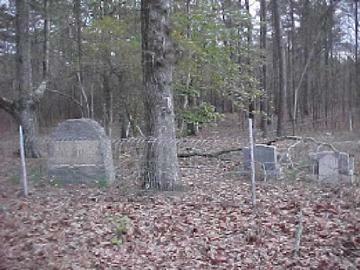 As you face the church, the cemetery will be on the left side of the church, up in the woods, just off the highway. The Hubert family established the successful Springfield school (a black grammar school) which prospered in the 1880s. "First Land Owners. Reared 12 children to Maturity. Great American Citizens." On same stone as and h/o Camilla Hillman. He went about doing good. Dr & death date on original "Sellers" stone. Replacement stone has only 1958. Devoted teacher, inspired leader and loyal friend. "Mother" Has two gravestones - an older Sellers funeral home stone and a newer granite one. At least 8 more graves marked by fieldstones or depressions.